You know it is a holiday season now, so do not be surprise about some companies or websites giveaway some holiday gifts, like free download software, free software serials or coupons. If you search some freebies that is a good chance. 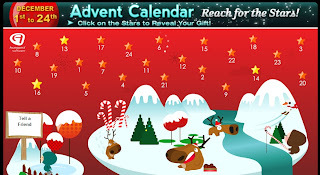 Avanguest Software site has a good promotion activity that giveaway some gifts from December 1st to 24th. Everyday it offers a software for free download and free code. You do not need do anything, just go to this promotion calendar, fill your name and email address into a small form, and pick up a day, after click it will show you what software you can get. If you like you just grab it. Today is December 6th, so you can pick 1st to 6th, do not pick late dates, it will show you too early. I know these software are not very famous but we can get them for free, why not?